Red lines on the map indicate doors. Blue areas are portals or teleportation circles to various places. The upper left one goes to a building in the Portal Farm. 1-4 Private Meeting Rooms numbered as labeled. These rooms are sized about 20’ x 40’. The decorations/lighting in these rooms are changed daily, and can be determined by a roll on chart X. Rent for meeting rooms is 5 sp/hour. 5. Stairs, located at the ends of the east and west wings. The stairs lead down to rooms below the tavern, available for rent. Prices on the rooms range between 5 and 30 sp per night. 6. Kitchen. Stairs in the back lead to the larder, staffed by one gopher who loads counterweights with the ingredients. Just outside the kitchen is a large, circular table and several bars. This is the feature area, where persons can talk with the head bartender and arrange meeting rooms and pit fights. It is also where large parties can organize and make drastic random decisions. 7. The Encounter Pit. This is a sandy, circular pit 90 feet across, set 2 feet lower from the rest of the floor. The area is encased by a glass dome, and 2 magical items are used to enhance the viewing of the fights. The tavern owner carries these. One is an item of Hear that he tosses in so that sound isn’t blocked out by the glass dome. The other is an item of Summon Planar Being (Psychoportation rank 14) that can be set for a rating level (relative “power” of creature). 8. Main Dining/Drinking. There are 4 main bars around the pit, fitted with stools for easy viewing. The room also has numerous circular tables for eating and carousing. Each table comes with 4 chairs, condiments, and a set of dice. 9. Quiet Dining. For those who are more serious about their dining/entertainment. This area is far calmer and quieter than the main dining/tavern. Tables here are typically 6 and 2 person circular tables. 10. Smaller rooms. For either meeting use or private dining at a rate of 3 sp/hr . The Random Encounter Tavern is located on a small island on the planet Jaern. The island is very far north of the typical adventuring locales, and is sparsely populated. In 10043, a wealthy former adventurer from offworld named Paul Dirac purchased most of the island and began construction on the tavern. He is a powerful psionicist who used his many talents to help turn this tavern into his perfect retirement job. Once construction was complete, he went to the Portal Farm portal committee and purchased a 10’ diameter piece of land contained inside another portal building. 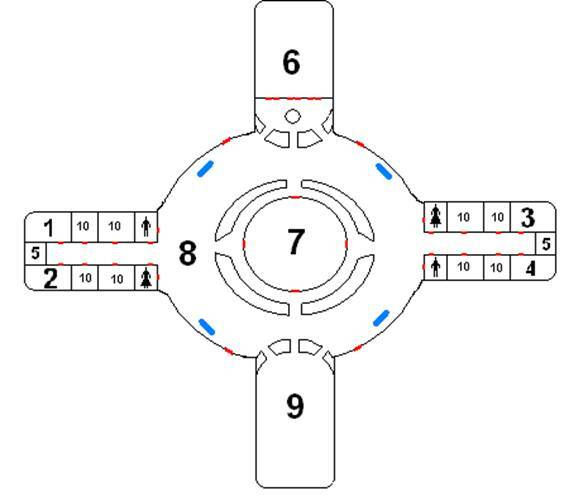 There he created a Teleportation Circle that leads directly into the main dining area of the tavern. Using the business connections from the Lojem mage’s guild, he found other investors that wished to establish portals to Jaern and didn’t want to lead directly to the already overcrowded Portal Farm. After three more portals were established in the Tavern, the owner Incarnated several psionic spells, including “Create Light” and “Whitefire” (cast on the stone roofs to provide warming in the colder environment, also as a light beacon for ships coming in) to give the place some atmosphere, and declared his tavern open for business in the last days of 10047. 1. It's an unimpressive room, but quite surprisingly sunny. The walls are wallpapered in an ugly orange, broken up by basic, pea green curtains on the windows. 2. It's a simple room, with walls carefully wallpapered in a soft amber and a floor that's dark blue carpet. It is sunny, though rather spacious. A map of the island is stretched across the wall. 3. The room is elaborate, with walls carefully wallpapered in dark green and a floor that's an intricate design of ceramic tiles. It is sun-filled, though rather low-ceilinged. Fancy rolling seats are lined up near the door, and a large workbench sits along one side of the room. 5. It's a paradoxical room, with walls tiled in springtime green and a floor that's cold, hard stone. It is bright, though rather small, and large, throne-like chairs sit cramped around a small wooden table. 6. The floor in this room is plush white carpet. The walls are dull beige with a border of dark green along the middle and bottom. A sawdust-like smell fills the air, until the harsh wind from the open window dissipates it. There don’t appear to be any seats, but large towels have been strewn about the room. 7. The floor in this room is tiled marble. The walls are soft amber with a border of stark white along the bottom. Cigar smoke permeates the room. Benches seem to be arranged facing a stone white altar at the far end of the room. 8. The floor is plain wood, painted an ugly orange and accented with a utilitarian grey rug that fits the confined room nicely. Plush armchairs sit about the room, arrayed in groups of three. 9. The room is badly lit, and echoing. The floor is cold flagstone. One wall is wallpapered in dark rose, while the rest are dull beige. A round table sits in the middle, surrounded by low chairs. 10. The room is well lit, and closet-like. The floor is a patchwork of small rugs. One wall is wallpapered in a drab white, while the rest are sky blue. A long wooden table sits in the middle of the room. No seats are evident. 11. The scent of autumn leaves is palpable in this vast room. The flooring is plain unfinished wood, while the walls are splashed in bright yellow. Elegant wooden seats sit invitingly around a large wooden table. 12. The walls in this small room are tiled with an ugly orange. A breeze comes through an open window, stirring the lavender curtains, and helping to disperse the strong cologne that clogs the air. Several tall stools are placed around a high table in the middle of the room. 13. The window curtains, flimsy and dark rose, blow in the mild gust. The floor is plain polished wood, and the walls are covered in graffiti. Three stained couches sit facing each other. 14. There are heavy curtains decorating the open windows in this modest room. An unpleasant mildew smell that permeates the room is stirred by the sudden wind from the windows. 15. There are lacy curtains decorating the open windows in this colossal room. The smell of decay lingers around a decrepit set of benches set beside the walls. 16. This colossal room is dim. The walls are black. A smoky smell suffuses the room. The floor is nothing but packed dirt. Large rocks are set in a circle around what appears to be a campfire. 17. This confined room is filled with light. The walls are wallpapered in pea green. A sawdust-like smell is palpable. The floor is adorned by a simple country rag rug. A dozen rocking chairs sit equally spaced about the room. 18. This huge room is adequately lit. The walls are dusky blue. An unpleasant mildew smell is almost imperceptible. The floor is tiled marble. Several large pillows are set about in one area of the room, and appear to be for sitting. 19. This small room is dim. The walls are carefully wallpapered in white. The scent of autumn leaves is quite evident. The floor is adorned by a simple country rag rug. 20. This tiny room is dim. The walls are painted in sky blue. A vague mustiness permeates the room. The floor is covered with an impressive oriental rug.